Surf helmet! You wear a helmet when you ride your bike. Extreme skiers wear helmets. And hey, when you are biking and skiing you can actually see what’s in front of you. You don’t have reefs and rocks hiding under water when you eat it. 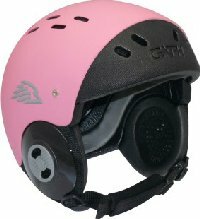 Gath makes a range of helmets specifically designed for a wide variety of sports, with visibility and movement factored into their design. The not cool factor of wearing a helmet is finally beginning to subside. Big wave surfers, like Tom Carroll, are adopting them to protect themselves from hidden under water hazards. And they even have a model with a built-in camera. So you don’t ride big waves? So you do worry about looking hot? If your board spins around and whacks you one, that’s not so hot. Neither is a trip to the ER for stitches. Even more importantly, a Gath water helmet could save your life. Getting knocked unconscious in a bicycle crash means you may be out for a couple minutes. Getting knocked unconscious when surfing could mean death or brain damage. Being alive with all the neurons twitching is pretty hot. So is living to surf another day.